Together with Ruud Janssen and Dennis Luijer, Roel is the author of Event Design handbook. This visual handbook demonstrates the why, how, and what of event design with the help of real world application and case studies that exhibit effective event design. It will change the way you think about how events change the world you live in. This book lays the foundation for creating a common language. A language that can be spoken and understood by those who know and those who don’t yet know the mechanics of events. It is a pragmatic approach for designing and creating events that matter. 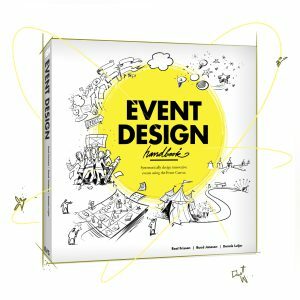 The Event Design handbook will change the way you think about how events change the world you live in. It shows the way to re-design your world on one sheet of paper using the #EventCanvas. Download a 72 page preview or order your copy right away. Prior to reading the full book, let us indulge you with a synopsis on 1 page of the EVENT DESIGN handbook. You start the journey of reading this book eager to discover new ways of innovating events. You may have just discovered how Event Design offers that potential. You are wondering how to inspire your team to join you on this journey whilst developing the ability to articulate how your events create value. These are the jobs you are trying to get done. People in your environment are asking for innovations yet your event is actually pretty good already. You bought the EVENT DESIGN handbook committing the time to read it and heard that if you claim the right amount of event design time, space and mobilise the team you will be empowered to put your trust in them and the process of Event Design. You expect this book to really help you get these jobs done at the cost of a lunch and a couple of cappuccinos. 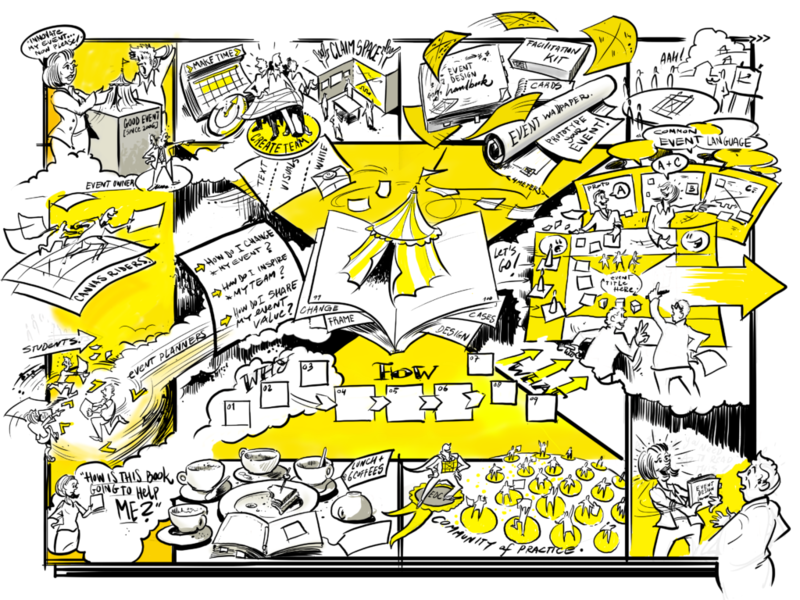 As you get into the flow of the book you discover an Event Canvas with a visual language that enables you to get to the core of your event design as a team. You discover how value is created through the CHANGE of behaviour of the relevant stakeholders, constrained by a design FRAME which ultimately prompts your team to come up with DESIGN prototypes. The most suitable of which you propose to your Event Owner. You have landed yourself in a community of Event Design practitioners and their case studies inspire you to use your new tools and processes to discover how to contribute to the strategic conversation and get a seat at the table. It’s you and your Event Design team that are setting the agenda and in the driver seat of delivering innovation to your organisation’s future. You are the Event Designers of the future, equipped, confident and having a blast designing with the end in Mind. Get ready to discover and pass on your new insights to enable teams like yours to become just as successful as you have. By handing them a copy of the EVENT DESIGN handbook. 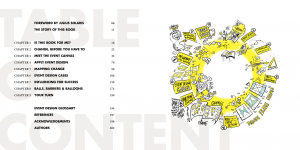 Oh, and did we mention the book comes with access to an exclusive online set of resources? Order yours today and access exclusive content available to readers of the book only.